This development of 853 flats and retail, commercial and community spaces is now into it's second phase of construction. The development includes 11 buildings ranging from 6 to 40 storeys high. The buildings sit on a newly created platform over Spending Beach. 40% of the residential units will be part of an "affordable housing scheme". 20 two bedroom apartments are being offered as shared ownership through Moat Housing Association. creation of new outdoor recreation and amenity areas. The scheme involves sustainable features, including renewable energy, and will reach an EcoHomes standard of ‘Excellent’. The developers celebrated the completion of the first phase of the development at a topping out ceremony on 9 March 2016. The planning application was submitted to the council on 4 April 2006 application reference BH2006/01124 and approved on 4 July 2006. 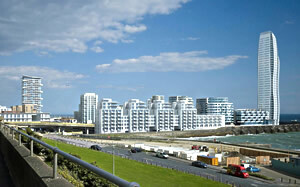 In addition to planning permission, approval was required from the council under the provisions of the Brighton Marina Act 1968. The act applies to buildings that would exceed the height of the cliff face immediately to the north. Since 2006 we've agreed some minor amendments to the application. The latest planning consent is application reference BH2015/04435. The inner harbour area is currently part of a strategic allocation for mixed use redevelopment in the Brighton & Hove City Plan. This includes a minimum of 1,000 residential units, 5,000 square metres retail and 3,500 square metres of leisure, recreation and community facilities. The council considered a planning application for major development at Brighton Marina for the Inner Harbour site submitted in September 2007 application reference BH2007/03454 by X-Leisure and Explore Living.